It’s the holy day for sports foodies and second only to Thanksgiving for eating calorie-laden foods. In order to give you some perspective, here are a few of your favorite Super Bowl foods and what it takes to burn them off. So read on to make sure your choices are splurge-worthy. Here are a few examples to give you a frame of reference. Fit tip: Use hot sauce without the blue cheese, and make the wings yourself. Go skinless, and bake them instead of frying. With all that football action to distract you, you probably won’t even notice the difference. It has meatballs, Provolone cheese and marinara sauce, double meatballs on a hearty Italian roll, adding up to 932 calories. Fit Tip: How about turkey meatballs (made with breast meat), low-fat mozzarella and a whole-grain hero? Or if sticking to Subway, try the Oven Roasted Chicken which is 467 calories for a footlong sub. The only problem is that, according to The Wall Street Journal, there are only about 11 minutes of actual ball playing in a football game. That means you need to play more than six games of professional football to burn off 4 Samuel Adams Boston Lager beers at 180 calories per 12 ounces. Fit Tip: There are some great light beers out there.Do a taste test before the game and see if you can make the event more special with some fancy low cal beers.Miller 64: 64 calories; Bud Select 55: 55 calories; Michelob Ultra: 95 calories; Natural Light: 95 calories; Miller Lite: 96 calories. Just one handful of nuts can mean loads of push-ups, sit-ups, jumping jacks, sprints and more. Just so you know, 1 ounce of mixed nuts has about 170 calories. Fit Tip: Nuts are healthy if you eat them in small portions – maybe 7 to 10. More than that is a mistake. Each chip is 10.5 calories, so that’s 84 calories. For each tablespoon of Frito-Lay French Onion Dip add another 30 calories, so assume a small dip, a half of tablespoon for each chip, which equals another 120 calories. Grand total: 204 calories. Fit Tip: Try a low-calorie dip or make your own with nonfat yogurt or nonfat mayo. And use popped or baked chips. If you have half the chicken share, that’s 3 pieces of original recipe: a chicken breast, thigh, and drumstick, which is 740 calories. Fit Tip: Bake skinless chicken and use whole-grain bread crumbs. One slice is 450 calories. Fit Tip: Try cheeseless pizza topped with plenty of veggies — broccoli, spinach, tomatoes, zucchini, mushrooms or even artichoke hearts. Also, avoid personal pan and stuffed-crust pizzas: The thick, oily crust means added fat and calories. Just one chip requires some serious rocking out. Twenty calories for each chip (yes 20!!) and 50 calories for 1 tablespoon of the seven-layer dip adds up to approximately 70 calories. Fit Tip: The answer is salsa — it’s very low in calories. And pick baked, low-calorie chips at about 120 calories per ounce. If you’re eating the chips, have one at a time, and don’t put out huge bowls of them. At 280 calories for 2 handfuls the mix is still high in calories in spite of being lower in fat than chips. Fit Tip: Don’t eat them by the handful, or skip them altogether and go for some low cal homemade popcorn. Or better yet, make it air-popped. Hot dogs wrapped in crescent roll or biscuit dough add up: Each one of those you pop in your mouth has 66 calories. Fit Tip: Use low calorie franks, maybe skip the dough? Get some fancy mustard instead. Ever try doing one of those cheerleading routines? I didn’t think so. Deviled eggs are made with mayo, and in case you weren’t sure, mayo is very high in calories. Fit Tip: You can use low-fat mayo, or how about just hard-boiled eggs with hot sauce or mustard? A cup of chili packed with beef, beans, peppers, onions and other assorted vegetables comes to about 350 calories. A blob of sour cream and some shredded cheese adds another 150 calories or more, for a grand total of 500 calories. Fit Tip: Replace the beef with ground turkey breast, or make the chili vegetarian. Top it with low or nonfat sour cream and cheese. The chips are about 13 calories each, and each scoop of guacamole is at least 25 calories, for a total of 38 calories. Guacamole is high in calories, but the good news is that avocados are packed with antioxidants, vitamins B6, C and E, as well as folate and potassium (60 percent more potassium per ounce than bananas), and they’re a great source of monounsaturated fat, which studies have shown reduces serum cholesterol levels when used in place of saturated fats. Fit Tip: Eat one at a time. 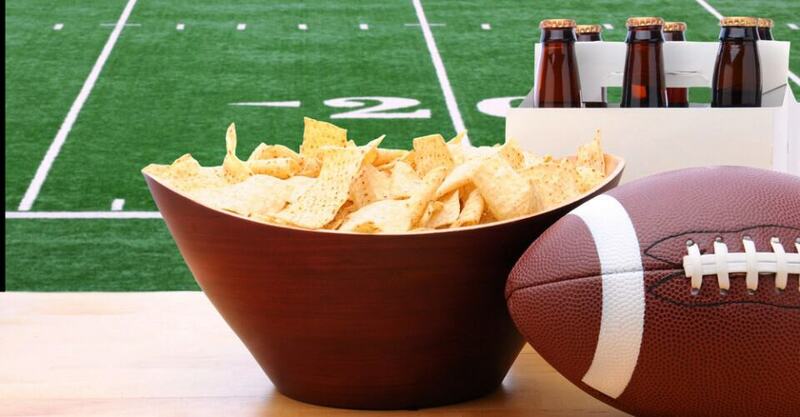 Don’t just sit with a big bowl of chips and guac in front of you while you mindlessly watch the game.